Identify the ideal fuel-air mixing ratio and optimise the engine's efficiency: LambdaCANc is a compact CAN measurement module for connecting numerous Bosch and NTK wideband lambda probes for the acquisition of Lambda and O2. 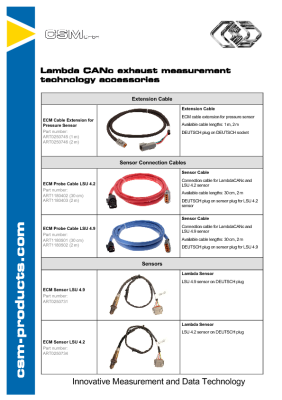 Easy exhaust gas measurement with LambdaCANc. Rugged displays for the connection to the exhaust gas measurement modules LambdaCANc, NOxCANt/g and NH3: The CSM OEM display variants DashCANc and DashCANc+, depending on the module, allow the immediate display of the currently measured values Lambda, AFR, O2, pressure, NOx and NH3 levels during test drives. Reliable measurement modules for the acquisition of NOx, O2 and Lambda: The measurement devices NOxCANg and NOxCANt from ECM, distributed by CSM, are universally applicable, compact CAN measurement modules for in-vehicle exhaust gas measurements. The reduction of emission values plays an essential role in vehicle development. In order to obtain meaningful measurement readings, CSM has expanded its measurement portfolio to include exhaust gas measurement modules from ECM.